It’s Not Like It Used To Be…. It’s been a few years since we’ve had to do any personnel recruiting at my own Dental Office. So you can imagine my surprise discovering what awaited me and the things that have changed in the employment landscape over the last three years. Now I’m not sure whether the changes in the employment environment have been a gradual thing that I’ve just not been aware of on my own personal basis, but I sure felt like I’d entered a whole new world and was having to make an immediate and significant assimilation, just to survive. I felt akin to the feeling, and I don’t know this one first hand, but I’ve heard that for divorcees re-entering the singles market, that the rules of dating and the dating landscape are quite different to how things were the last time around. And that, for some singles, can be intimidating. And frustrating. So back to the Sydney dental employment market…. Firstly, there just doesn’t seem to be as many quality applicants around any more. This could be due to number of reasons. The recent artificial increase in numbers of registered dentists may be having its effect on ancillary staff, with the employment pool being stretched to spread over the extra dentists out there setting up dental offices. You would think though, that as dentistry is a supply and demand sort of industry, that the amount of patients needing dental treatment across a city or a county or a state would reflect upon the number of ancillary dental staff needed. So with a sudden rapid increase in the number of dentists being registered, to treat the same number of patients in the population, with the same number of employees to choose from, then there are far more positions available for auxiliary staff to pick and choose. Therefore, when a new position, like mine, enters the job market, there aren’t that many potential applicants around to jump at the prospect of new and better employment. Secondly, there appears to be a dumbing down of applicants coming in. Not only to apply for positions vacant, but also to help out as well. The nature of employment law down here in Australia is just so heavily weighted against the employer now. When I first entered the non-dental employment landscape back in the 1970s, people were afraid of losing their job. Now it’s almost impossible to lose your job. Way back then, you were terrified to be absent, or to do something wrong, in case you got the sack. In 2014, it’s impossible to be fired. It’s called “Unfair Dismissal”. Now, in 2014, sick days, whether paid or unpaid, are just taken. Even temporary staff take sick leave at will. The agency is having to provide relief staff for the relief staff…. Sadly, the thinning of the employment pool is having a detrimental effect on the quality of service our clients, customers and patients are receiving. And because it has become so difficult to find and hire any committed employees, employers are often forced to settle for second or third best to help out while they continue the search for that ultimate, trained, educated and motivated applicant to step into their role full time. Even the quality temporary staff from the agency is thinning. Traditionally temporary staff have been good employees often just between full time jobs. Sadly, good temporary staff are also becoming few and far between. Or is it just that a career in dentistry, as a dental assistant working through the ranks to front office and then office manager, is now not a desirable career being chosen or offered to school leavers? Are the school leavers of today and the last ten years not even considering dentistry as an option any more? Because it’s hurting our industry. The end result is that the consumer does not receive the best product. An industry scratching for sufficient good quality motivated and qualified and successful staff is an industry falling down on its core values. What’s your industry body in your region doing about this quality manpower shortage? It’s not OK for the powers that be to be pumping out new graduate dentists and registering overseas trained dentists in large numbers if the ancillary staff aren’t available to make dentistry a pleasant experience for all patients. The dumbing down, using unmotivated and less than optimally trained staff, will only add to the commoditization of dentistry. Employing and training the right people is just one of the straightforward components of The Ultimate Patient Experience, a simple easy to implement system that I developed that allowed me to build an extraordinary dental office in an ordinary Sydney suburb. If you’d like to know more, ask me about my free special report. The thing about customer service is that it’s a full time career. It cannot be turned on, or off, like a tap, or faucet. It can’t be given, or not given, at will. And the reason for this is because it’s not tolerated to be received piecemeal. As consumers ourselves, we expect good service. Each and every time, or moment of the day. Why shouldn’t the people that we deal with, whether on a regular basis or on a casual once off basis, why shouldn’t they give great customer service to us every time we encounter them? And I’m not just talking in a retail, or business, or a work environment only. I’m also talking in a social, non-work and even family environment as well. And I’m also talking in a back of office, or behind the counter moment. Why can’t we be kind, courteous and helpful towards every person we meet and encounter from eyes open in the morning until head on the pillow at nighttime? You see, some people, it appears, just can’t be nice. When you meet them, in their work environment, *you* are an interruption to them. They don’t want you there, and they have no difficulty in exuding that emotion straight into you, either verbally, or kinesthetically, or both. And you may not even be a customer to them! You may be a co-worker!! It can also be the same socially, or at home as well. How many times have you encountered someone, in the street, in a line, or just plain out and about, who looks and acts like you are an interruption to their day, like you just shouldn’t be where you are, and why the heck don’t you just go away? And this might not be a total stranger. It could be a family member whose “moment” in time you have interrupted or broken. And that’s a tough one. There’s a distinct point of difference or disagreement that can be debated until the cows come home as to whether the “moment interrupter” should be frowned upon or scolded even just because they happen to interrupt. Should all interruptions be allowed, or expected, and be welcomed with a smile? It’s a real grey area. It’s open ended. That’s for sure! So, how should we behave when dealing with people, all people? I believe that great customer service, or great people skills, as they really need to be, are learned skills and not inherent. Nobody is born with great people skills. And as such, they can be learned. And unlearned. And re-learned. Because that’s all that customer service is…. it’s the skill of learning how to deal with people in our own day to day travels and encounters such that we make a positive difference, or positive impact, to their day. And why shouldn’t we try to do that? Why shouldn’t our aim be to leave every encounter with every person, be it business or social or family, making that person feel better than they felt before their encounter, meeting, or dealings with you? Because customer service isn’t just about serving those who give us money. It’s about making a difference, an improvement. And it’s about doing that to everyone. Every time. Every day. Dentists Don’t Charge Enough For Their Services! Who’d be a dentist for quids? Or, more specifically, who’d be a dentist owning and running a dental office? Last weekend at a non-dental congress I had the misfortune of someone leading with a comment that dentists make a lot of money. Well wave a red flag at me!! Because I don’t think they get paid sufficiently for the duties that they perform and the role that they have in society. Dentists don’t charge enough for their services. And all the other things they do. And have to do. Performing intricate medical procedures for fees often less than plumbers charge to fix roofs. Years and years of education and university fees and taxes, and student loans and student debts. Just to get a degree and a license. And don’t mention the establishment costs of buying a business or building a start up dental office. And out there in the marketplace, from what I see, dental office owners don’t put their fees up in line with inflation, cost of living, material supplies, rent rises and salary increases. So they’re giving themselves a *PAY CUT* every time they don’t keep fees in line with these market forces. Because those market force increases just eat straight into the bottom line. On a second note, most or nearly all dentists I meet *DO NOT* run their Dental Offices arithmetically. They do not run them by formulae. They run them by gut feel. Most Dental Office owning dentists fail to pay themselves a salary firstly out of their earnings. Or, if they do, it’s a dribble. Never a good salary. They might take bits of money here and there, but more often than not, there is no structure to their remuneration. So, guess what? They end up paying themselves lastly, if at all. And there’s no reason for them to punish themselves in this way. We know associate dentists, working in other dental offices, receive remuneration based upon a percentage of billings, or gross fees. 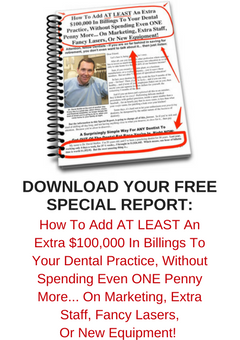 So why shouldn’t Dental Office Owners get paid up front the same way. For their “just drilling teeth” roles? Then, out of what’s left on the business side of the ledger, the dentist owner needs further remuneration for all the other roles he performs. Sadly, these additional duties that are performed by a dental office owner, go unpaid. Performed, yet not remunerated for. Correctly. And often, they are performed in after hours time slots. After dinner, lunch times. Weekends. Sunday nights. Oh, the joys of being a small business owner….. Sadly I see this right across the board in private dentistry. And simply, it’s because Dental Business is not taught in Dental School. The running of the business of dentistry, is a BIG part of The Ultimate Patient Experience, a simple easy to implement system that I developed that allowed me to build an extraordinary dental office in an ordinary Sydney suburb. If you’d like to know more, ask me about my free special report. Two words that strike *FEAR* into the hearts of all human beings. Jerry Seinfeld tells it best. He says, the number one fear in America, is Public Speaking. Number Two, he says, is Death. Or Fear of dying. He then says, that what this means is that at a funeral, most people would rather be in the coffin than up giving the eulogy. The silly thing is, that the principles of giving a good public presentation, of writing a speech, of giving a keynote, are the same as the principles of World Class Customer Service. I had the pleasure this last weekend just gone of attending the 2014 National Speakers Association [NSA] of Australia Annual Convention. This was my first NSAA convention, and in fact, my first ever NSA meeting or function or presentation. One of the major things I learned, which I’m going to share with you in a moment, was one of the first things I learned, during what turned out to be just the most amazing four days of information, ideas and abundance and sharing. Because just as people are scared of the thought of public speaking, I’ve got to say that the thought of being locked into four full days of convention with two hundred or more public speakers, was not really something that I thought I’d ever want to do or experience or put myself through. So the four days ended up being a progression and procession of light bulb moments going off in my brain. And what surprised me was that the principles of building a keynote, of conducting a webinar, of pitching yourself on paper, of creating a TED talk, are the same principles that make up the foundations and the core values of providing a World Class Customer Experience in your business. So here’s my pearl, which fortunately for me, was delivered early on Day 1 by speaker Tim Longhurst. And as a theme, what Tim said, ran like a dominant river throughout the following four days. He said that it’s about connection with your audience. And that everyone in your audience is wanting you to be successful, because they’re wanting you to make your presentation a memorable experience for them. Finally, Tim said that Content Is Talk. The world is awash with information. Your audience can get information anywhere. He said to be inspirational. Be a point of difference! Whether you’re listening to a keynote speech, or whether you’re visiting your dentist, you’re investing your time, and you want a return on that investment. You want that time to be a memorable experience. Not just another dental visit…. But it does often end up that way. It becomes just another dental visit for our patients. As dentists sometimes, most times, we just get so caught up in going through our own motions. So much so that we fail to connect with our audience, our patients. We become so engrossed in our own self-importance, in our own wonderful new technology, in our own bright shiny objects that we forget to connect with the heart and mind of the human being whose teeth and gums we are treating at that appointment. And in so doing, we just start “talking content”. And when we fail to connect we allow ourselves to become a commodity. Something that our clients and customers can get anywhere. If we fail to connect, we fail to create a point of difference. A reason why we are *THE* only dentist for them. That they will travel halfway across town to see. And they’ll do that, they’ll cover those miles, when you show your clients consistently, that you are not just their dentist. You are also, and firstly, the Custodian of the Experience of each and every client of your office. Don’t get so caught up in your stuff. In your equipment, in your news. Be in your patient’s moment. Be a point of difference compared to any other dental office. Be a point of difference compared to any other business they deal with. Three Reasons Why Lack Of Follow Up Is Killing Your Business. And Two Easy Ways To Fix It. I was asked yesterday by one of my readers whether I had written any articles or blogs on the benefits of follow up. Now I wasn’t really sure whether I had or not. So what I did promise her was that I’d do my best to whip up one for her this week. You see, the way that I see it, there is absolutely NO REASON ON EARTH whatsoever that every patient of your dental practice should not to be followed up. Once a client or customer becomes a patient of your dental practice there is always a reason why they should always have an ongoing appointment. And if they don’t have that appointment, then they need to be followed up. Because they MUST have an ongoing appointment. There is absolutely NO REASON why they should not. So if they leave your office without an appointment it is your moral obligation and duty to follow them up until they make that next appointment. Somebody once asked me what it was like looking underneath an old amalgam filling once it had been removed. It’s like looking behind your fridge, or your washing machine. And it’s the same looking behind those lower anteriors. After three or six months, the build up and infection begins. And it doesn’t go away…. And it needs to be removed. Because just like the stuff behind your fridge, that build up and infection does not just remove itself by itself. And so if you allow your patients to leave without an ongoing hygiene appointment, then you’re a co-conspirator in the harbouring of disease within that poor patient’s mouth. It is your moral obligation therefore to follow up follow up follow up your patients and ensure that they maintain their regular hygiene visits for their own benefit. To reduce disease and the incidence of disease within their oral cavity. And beyond, because we all know now of the systemic links between poor oral health and poor general health. And it is our moral obligation to ensure, as health care practitioners, that we have done everything in our powers to make sure our patient returns. The second, very logical reason that ALL patients need to have ongoing appointments with our Dental Office is that it just makes better business sense to do so. Look at a dental office that does not schedule appointments in advance for ongoing hygiene or to review questionable teeth and conditions. You can laugh, but there are Dental Offices out there with hundreds, if not thousands of patients who need to be in regular care but who are left to their own devices. Roaming the streets with conditions that need reviewing. With conditions that need treatment. That we need to treat. That we should have treated. And for every one of those patients that we’ve let walk off into the ether without an ongoing appointment? Well we’ve got to find someone else, another patient, to replace the first patient who should have had that appointment for treatment in the first place. So our dental office needs twice as many patients just to do the same business. Because we now need a second patient for every patient that we fail to re-appoint and schedule for that ongoing treatment or review. The purpose of an appointment is to make another appointment. In Amway, the reason they lend you a tape is not so that you listen to it. It’s so that they need to make an appointment to come around and see you to pick up that tape and to give you another. The purpose of an appointment is to make another appointment…. And then he offers up this pearl…. In dentistry, it’s easier to make a patient keep an appointment than it is to call them up to make an unmade appointment. So backed with these two scheduling thoughts, and the notion that dentistry is not static, but rather an ongoing disease in constant progress, well there’s no reason at all that each and every one of our patients should never not have an appointment, and should never NOT be followed up. The importance of follow up is just one part of The Ultimate Patient Experience, a simple easy to implement system that I developed that allowed me to build an extraordinary dental office in an ordinary Sydney suburb. If you’d like to know more, ask me about my free special report.